Cute little snowmen to brighten up the cold of winter! Either size can be made in less than an hour, using scraps of yarn and a few notions. Use them as tree decorations, or put a pin back on, and wear a cheery little guy on your coat or hat! Add them to holiday packages for a personal touch in gift wrappings! US F/5 (3.75 mm) or size needed to obtain gauge. Repeat rnd 1 of Head. Repeat rnd 2 of head, but do not fasten off. *Sc in next st, 2 sc in next. Repeat from * around. Fasten off. Use tail from first circle (Head) to sl st head to body, over 3 sts. With bright colored yarn, ch 4. Work 4 dc in 4th ch from hook, turn and sl st in front loop only of each dc and beginning ch. (5 sl st) Fasten off and weave in ends. With bright colored yarn and leaving a 6 inch tail at beginning, ch 10. Sl st in 2nd ch from hook and each of next 2 ch. Leaving remaining ch unworked, ch 6 more. Fasten off, leaving a 6 inch tail. Knot and tie 2 more strands of yarn at each end, for fringe, and trim all fringe pieces to about ¼ in. length. Weave in all ends. Glue red pompon to center of head for nose, with eyes glued just to either side, leaving top half of head bare. Glue hat to top half of head. Glue jingle bell or pompon to top of hat. Glue 3 black pompons in a vertical line on body. Glue, or sew with matching yarn, to attach scarf to neck. Optional: glue or sew pin back on back of snowman, or attach a hanging loop of yarn to top of head behind hat. Follow directions for small snowman’s body to make larger snowman’s head, leaving tail for attachment to body. With bright colored yarn, and leaving a 6 inch tail at beginning, ch 10. Sl st in 2nd ch from hook and in each of next 2 ch. Leaving remaining ch unworked, ch 6 more. Fasten off, leaving a 6 inch tail. Knot and tie 2 more strands of yarn at each end, for fringe, and trim all fringe pieces to about ¼ in. length. Weave in all ends. Glue red pompon to center of head, for nose, with eyes glued just to either side, leaving top half of head bare. Glue hat to top half of head. Glue jingle bell or pompon to top of hat. Glue 3 black pompons in a vertical line on body. Glue, or sew with matching yarn, to attach scarf to neck. 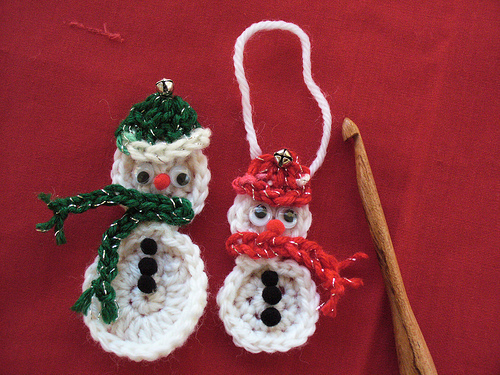 Optional: glue or sew pin back on back of snowman, or attach a hanging loop of yarn to top of head behind hat.